Foodmantra: Dhaba-style Makhani Dal… Now Anyone Can Make It! Do you really have the luxury, time or money to drive down to that Dhaba on the outskirts of your city whenever you like? 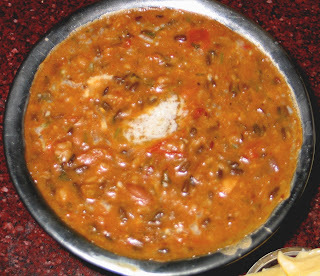 Just to eat that awesome, Dhaba-style Dal Makhani will you spend all your weekends hanging out at the same place, week after week? Why not bring that Dal home? I am about to tell you how you are going to do that. I tried this awesome dal makhani one Saturday afternoon at the Dara’s Dhhaba with Ankit, with who I happen to share a lot of my meals, at home and outside. I was ranting about that dal for days, I loved it and every time we went out to grab a bite, I insisted that we go to Dara’s Dhaba which was far, far away nearly on the outskirts of Mumbai city. Finally, Ankit had no choice but to share with me, the recipe of Dara’s Dal Makhani which he had guessed, on one of his culinary adventures and succeeded. So, yes this is Ankit’s Dal Makhani recipe but no I did not stick with it. I had that flavour of Dara’s Dal makhani so clearly etched in my memory, that flavour of ginger, coriander and, Butter, lots of butter, that I took down his recipe and added my own twist to it, to make it taste more like the Dara’s Dal Makhani that I remember. Soak the Rajma and Black Urad Dal overnight. If you cannot soak it overnight then atleast soak the Rajma for 3-4 hours. In a pressure cooker, add the soaked Rajma and Black Urad Dal along with 10g or a half inch piece of ginger, crushed , salt and 400 ml of water. Boil the Dals, reduce the heat after the first whistle of the pressure cooker and turn off the heat after the second whistle. Allow it to cool down, till then prepare the tadka. Heat 30g of butter in a pan, add cumin(jeera), garlic, grated ginger and allow in to lightly brown, then add crushed spring onions, chopped onions and allow them to brown. Once the onions are deep brown, add in the chopped tomatoes and allow them to cook till they soften and the mixture leaves the sides on the pan. Add Dhaniya Powder, Red Chilli powder and mix well. Add in the boiled dals from the pressure cooker into the pan with the cooked onion tomato mixture. Add salt if required. Mix well. Allow the mixture to cook until the mixture is well cooked and slightly thick. Turn off the heat on the pan. Add the chopped coriander greens and cream. Stir Well. And then, add in the magic, the remaining butter into the Makhani Dal. And let me know how it turned out. It looks like you are big foodie, and its so nice to know that you loved Dal Makhni at Dara's Dhaba.